Rebecca Amis Lawson, MA, R-DMT, lives in Chapel Hill, NC. Rebecca synthesizes 16 years of studies with Emilie Conrad and Susan Harper in the field of Continuum and exploratory consciousness. She is a teacher, therapist and group facilitator with 39 years of extensive studies in somatics, psychology, and dance. Rebecca earned her Masters Degree at NYU and is a registered Dance Movement Therapist. She was a professional dance performer and teacher for 25 years. She taught at various colleges and dance schools in NYC and NC; and was the sole choreographer and artistic director of her own company. She has extensive training in body alignment, ideokinesiology, effort/shape analysis, authentic movement, yoga, pilates, connective tissue massage and improvisational movement. She is currently a Continuum teacher, psychotherapist, and a somatic practitioner using the body and movement to facilitate the therapy process. In her private practice, she works extensively with individuals seeking personal growth and self-actualization incorporating the body, movement, and experiential processes. With individuals and groups, she has been able to coalesce psychological mindedness, a love of dance, and a heartfelt sense of humanity to facilitate discoveries that are revelatory, expressive, and creative. 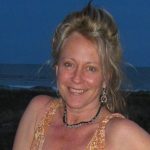 She teaches workshops internationally in Continuum and Exploratory Consciousness. The practice of Continuum has helped me to deeply open my capacity to listen to what is calling to be expressed. By diving into the endless unfolding and the ongoing discovery of our fluid nature, the creative process of movement is amplified. In a sense, I am being choreographed instead of doing the choreography. I also am able to drop down deeper into the emotional content that may be giving impetus to the dance. Continuum has absolutely helped my physicality to be nourished and stay resilient for dancing.